It seems like I'm always changing my pages or adding something new, so to make it easier for folks to get around, I decided to create a main menu & "what's new" page. This page contains a list of all the updates and additions to my site, and also has a site map that includes links and descriptions for every page. Another easy way to get around my place is to click on the site map button which is located at the bottom of each page. When you care enough to send the furry best! Meet the Winners of the I Look like Tigger contest! Message Board...post your announcements here! Meet Boomer, my 100th Club Member! More than 200 member photos! Dec. 3,1999.....I've really been falling down on the job when it comes to updating my what's new page. I promise to do better from now on. We have winners in the "I Look Like Tigger" contest...you can meet them here! I've also added a whole new page of club members...check out Page 20. And PLEASE be sure to come along with me on My Christmas Adventure! There's a gift for you at the end. Oct. 3,1999.....Added more club members on Page 19 and more contestants in the I Look Like Tigger Contest! Sept. 26,1999.....Added more club members on Page 18, added a new page and award in honor of my friend, Cody, the I Believe in Miracles Award, and added new winners of My Lifesavers Award. Sept. 19,1999.....New contest! Enter the I Look Like Tigger Contest! Lots of great prizes! Sept. 10,1999.....Named the featured club member for September. Click here to meet my friend, Sweeney! Sept. 5,1999.....Added lots of new club members...see pages 17 & 18. I also presented my Lifesaver Award to some very deserving sites. Be sure to visit the winners! Aug.22,1999 .....Added new memorials to the Rainbow Bridge page, and added a whole new page of club members! Aug.6,1999 .....Be sure to go and meet my featured shelter cat club member for the month of August. her name is Chloe, and her special page is here! July 4-25, 1999..... Added several new club members...see page 15 & page 16. There were also several new Lifesavers added...check out the award page to meet the winners. July 3, 1999..... Named the featured club member for the month of July, my friend Hope! I also started a new message board. Please feel free to add your comments, announcements, questions, etc. June 26, 1999..... WOW! I won first place at the Warehouse of Pages contest! That means I'll be in the quarter finals, so please vote for me on July 7th...I'll post the link later. June 25, 1999.....Presented the Lifesaver Award to a wonderful site, Westside Animal Rescue! June 20, 1999.....Added a new club member...go to Page 15 to meet Jiyna! 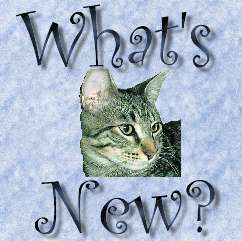 June 10, 1999.....Added new shelter cat club members... go to Page 15 to meet Chipit & Whiskers. June 5, 1999.....Named the featured member for the month of June. Be sure to visit Yo's special page! Updated Tigger's, Noah's, Cosmo's, & Cleo's pages & added a new page for Xena. Added Live streaming video to Tigger Cam. We were honored to win several awards and we also presented Tigger's Award to some wonderful sites. Be sure to check out the winners on my awards page.